Steven (Chicagoland, United States) on 14 April 2016 in Documentary & Street and Portfolio. This artwork, done by artist Terry Pyles, is named in honor of the Haida Native carver, Jones Yeltatzie (1900-1976). It replaces a painted wood sculpture, carved by Yeltatzie in 1963, which occupied this site for many years. 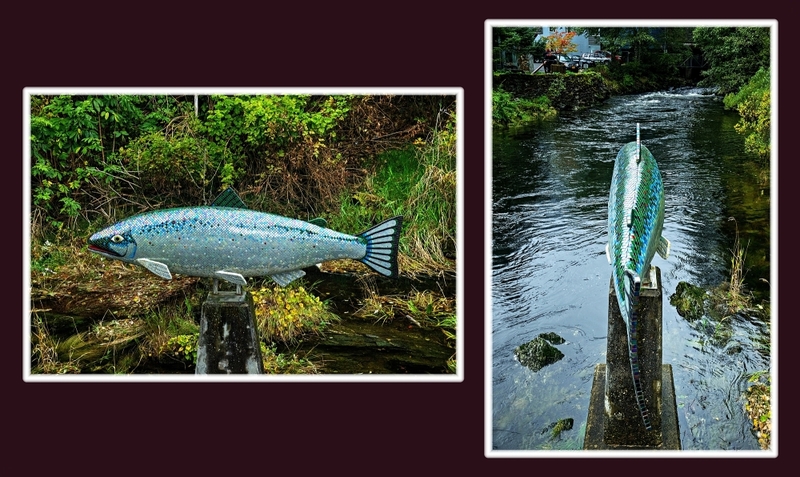 This was dedicated on July 4, 2013 and commissioned by the City of Ketchikan. The profile view of the fish (left) was taken from the western bank of Ketchikan Creek. The aft view of the fish (right) was taken at the end of the boardwalk of Creek Street looking up the creek in the direction the fish would swim to spawn. Here it actually looks like the fish is swimming upstream. Photo captured September 17, 2015. Fine artwork and well-presented here. This is in the right place ! Good colage. Interesting colorful sculpture, unusual place ! Une très belle stature très beau ton montage! Superb presentation and great story ! Interesting story and lovey piece of art to honor the original carver. Thank you for posting both views. It really showcases the beauty of this art. Et bien un sacré saumon superbe vues en large et long génial. Very "lifelike." I really like the POV is the fish "swimming" upstream. I am also glad to see the town honor the artist ... the original artwork succumbed to nature so the town commissioned a new one. Not many places would go out of their way to do something like that. Thank you for sharing the story. A lovely sculpture. Beautiful images of the art and the setting. Nice view of the sculpture. A gorgeous carving with beautiful color and detail. A wonderful tribute to the artist! And I thought you were showing off your catch. This one didn't get away. Superb work, splendid images !!! An excellent image documenting an occasion and good information for us viewers. Fine artwork and good note, Thank you Steven. Have a nice weekend. That is a nice piece of art. It must be at the start of its journey before it has had the crap beaten out of it. What sort of salmon is it I wonder?